Church Garden – our ten acre garden is nestled under the Kaitake ranges, a part of the nearby National Park surrounding our favourite mountain, Mt Taranaki. It’s a little bit of paradise with a fascinating collection of trees & shrubs blended into the garden landscape, with hostas, day lilies & mondo grass used as massed ground cover to contrast the busy areas. Together with the exotic plantings & a large central pond, the garden has become a haven for native & exotic birds. Many rare plants can be found; for example, Glyptostrobus (the Canton water pine), Emmenopterys henryi, Neolitsea & many rare maples, magnolias & rhododendrons. The garden has the best collection of hydrangeas in the country. There are several theme gardens including an Appalachian American landscape & a Chinese collection. 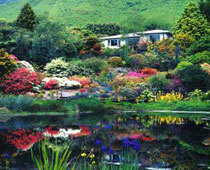 It’s a plantsmans garden & a pleasant stroll for all visitors. With many contacts overseas and our own quarantine house we have imported many rare and unusual plants, some unique to our garden. Glyn – I’m a plantaholic. 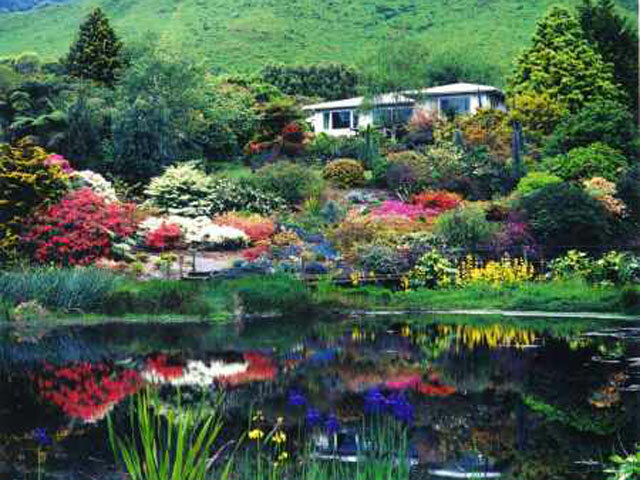 Gail describes me as a “horticultural delinquent” because I’ve worked in nurseries, parks, botanic gardens, fruit farms and even had a go at landscaping and indoor plant decoration for the rich and famous in London. Basically anything to do with plants I’ve had a go at it. After teaching horticulture at the Open Polytech for seven years I wanted to get my hands dirty again and so we bought the property back in 1986. Gail – is a primary teacher who luckily enjoys plants and gardens. Together we’ve created the gardens.